All meetings will begin at 9:30 a.m. in the Bibb Co. Engineering Annex, 760 Third St. If you have any questions, please contact our office. Macon-Bibb Visual Prefence Survey done by A. .Nelessen Associates, Inc.
Atlanta City Council passed a resolution that transportation professionals should use descriptive words instead of biased transportation language. (top-left picture) Theresa and Milton McKinney look at road plans in front of Jim Thomas. The McKinney home is being threatened by GaDOT plans to widen and move Sardis Church Road. See news articles here: about Sardis Church Rd. (top-right) Christine Barwick who lives off Park Street outlines her neighborhood concerns about cut-through traffic speeding. I attended the TCC meeting on Wednesday, 12-12-07 and their agenda was essentially the same as ours. During the "Old/New Business" portion of the agenda, Vernon made the announcement that the TCC and the Policy Committees would have added to their agendae a section for "CAC Report". (This was agreed on by the TCC and I suppose needs to be done for the Policy Committee, too, so whoever goes next Wednesday make sure it is mentioned.) This is a good step, and I thank Vernon for it because it gives us a scheduled portion of those meetings and treats us less like a step-child. Vernon asked, and I agree, that when we give our reports, that the motions we report which are votes on agendae items be separate from any "New Business". This makes sense to me and I had thought of separating them on the attached memo anyway. As for the fate of our motions, please refer to the attached memo with its eleven motions. The first four motions are reporting our votes on the agenda items. # 5 was discussed, although not voted on, with the FHWA representative and they were asked to investigate possibilities to accomplish this. They asked that we identify the specific issues and that they would see what they could do. Now, the motion asks for not just FHWA participation, so we need to suggest others and bring the concept to the MPO. # 6 was discussed, heavily supported by both Vernon and Jim Thomas, and approved. It needs to be taken to the Policy Committee as well. # 7 & # 8 were deferred until GDOT can inform us what they can do. Their representative promised that he would have an answer by the Policy Committee meeting on 12-19-07. So, it needs to be brought up and re-introduced at that meeting. (However, I can tell you that the words "halt all work" will kill it, so my suggestion is to be open to ammending it to make the main focus of the motion be "communication".) I said that these were being introduced on behalf of citizens who had come to us with problems, that the MPO staff had no idea what the situations really were, that we and they were frustrated, etc. Again, Vernon and Jim were supportive of the motion as a way to force communication their, and our, way. # 9 was not voted on, per se, but Vernon made an impassioned speech about the need for this and there seemed to be a lot of agreement in the later discussions. This needs to be brought up at Policy for a vote. # 10 & 11 were not asked to be voted on by TCC. They really should just go to the Policy Committee, but I brought the TCC's attention to them and said they would be introduced at the Policy meeting. Lastly, staff announced that they were trying to go pretty much "paperless" for all committees in the future. Environmentally, this is a good thing. However, my later thought on it is that it is a little unfair to CAC in that the other committee members can print out, at tax-payer expense, the reams of paper and reports, whereas the CAC members would have to print them out at their own private expense. This does not seem quite right to me, and I will send Vernon a note about it, asking that the CAC be provided a few hard copies of the available (online) reports in the future. Sorry I won't be able to attend on Wednesday,... I could not reschedule. 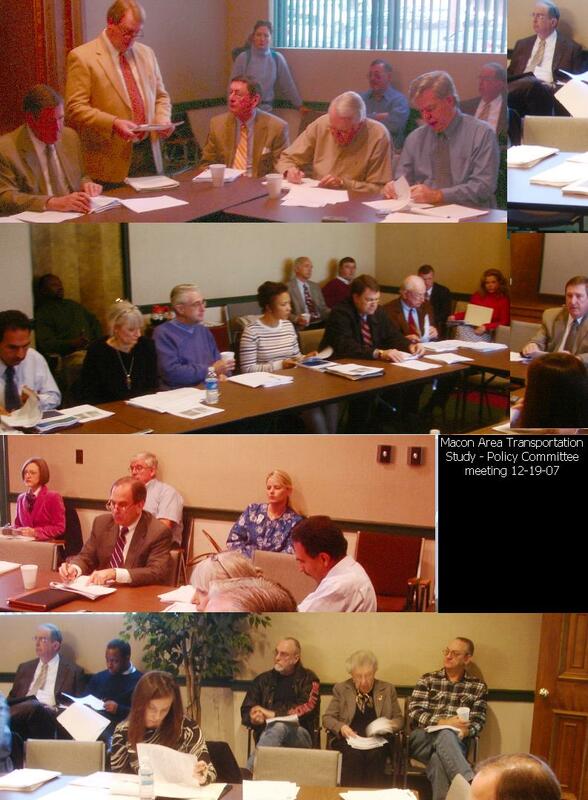 1) The CAC voted to accept, without comment, the draft of the Unified Planning Work Program, FY 2009. 2) The CAC voted to accept, without comment, the Congestion Management & Air Quality Projects. 3) The CAC voted to register its agreement with the mathematical precepts of the Year of Expenditure Program Costs, however the committee does not agree with all of the projects and, therefore, cannot recommend approving or accepting it. 4) The CAC voted to pass along with no recommendation the Conformity Determination Report due to the fact that committee members do not possess the technical expertise to evaluate the data although we do question some of the assumptions and analyses. 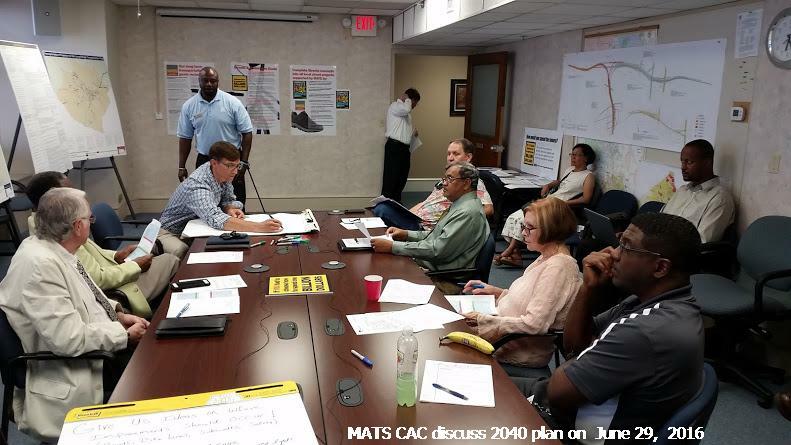 5) The CAC makes the motion that the MATS staff investigate and arrange opportunities designed to educate the public and public officials about good transportation and urban planning issues and concepts. Such forums may include, but will not be limited to, FHWA personnel. 6) The CAC makes the motion that it be made a policy of all three MATS committees that all committees receive the agenda and all information and documents, which are to be reviewed and voted on at their next meeting, at least two full weeks prior to their respective meetings. Therefore, whichever committee meets first in the three-meeting cycle cannot be held unless this requirement is met and the two subsequent meetings must be scheduled accordingly. of rights-of-way and construction easements, and all other pertinent information and documentation for all projects, current and future, which are planned for the MPO. 8) The CAC makes the motion that all RIP projects be transferred into the MATS process. 9) The CAC makes the motion that a “Needs Assessment” be conducted on all current and long-range transportation-related projects for our area which will include determination of a need for additional projects. 10) The CAC makes the motion that the Policy Committee hire an expert urban planner, acceptable to the Forest Hill Road residents, to assist said residents in the proposed mediation. 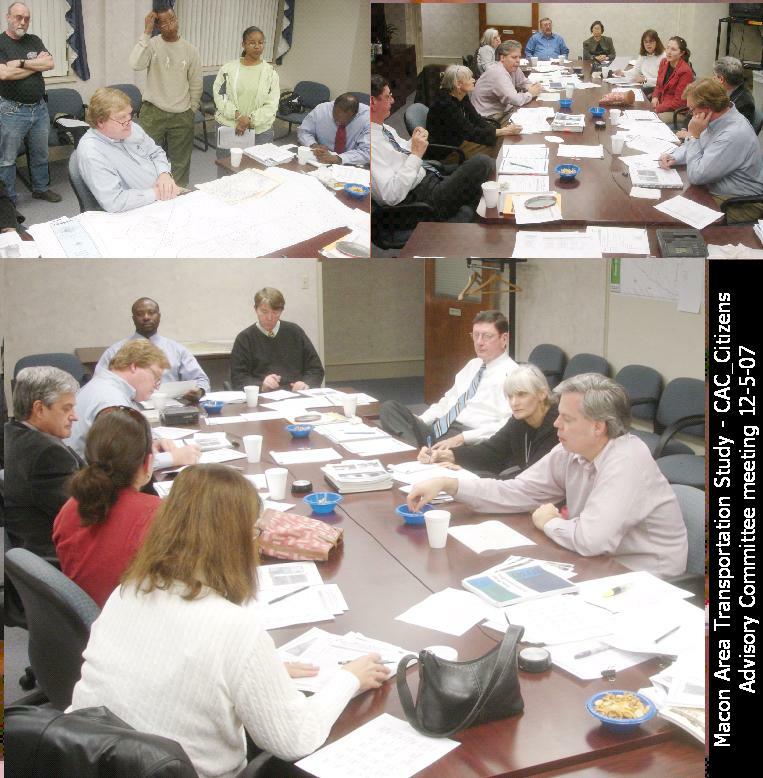 11) The CAC makes the motion that the Policy Committee ask GDOT to hold an “open discussion” public forum, with a Q&A-format, regarding the Forest Hill Road projects which includes current maps showing the project design, landscaping and right-of-way plans prior to the proposed mediation. Here is audio of meeting - 12-19-07 The audio is 11.5 MB big in MP3 format. It should open automatically with Windows Media Player, or it may just simply open automatically in another program. A meeting of the MATS Policy Committee was held on December 19th at 9:30 a.m. in the County Engineering Annex. There were 8 voting members present, thereby establishing a quorum. The minutes of the previous meeting were introduced and approved. The first item discussed was the draft Unified Planning Work Program (UPWP) presented by Jim Thomas. Mr. Thomas stated that this document outlines the work tasks by funding category and the final copy of the UPWP will be presented in May. Subsequently, a motion was made by Susan Hanberry Martin and seconded by Elmo Richardson to approve the draft UPWP. The motion was approved unanimously by the committee. The next item was the Long Range Transportation Plan (LRTP) and TIP amendments presented by Vernon Ryle. According to the SAFETEA-LU requirements, projections by network year for road projects are required based on year of expenditure amounts. Therefore, the revenue and cost items for projects must use an inflation rate to reflect the year of expenditure dollars. Furthermore, the plan must be financially balanced according to the requirements. 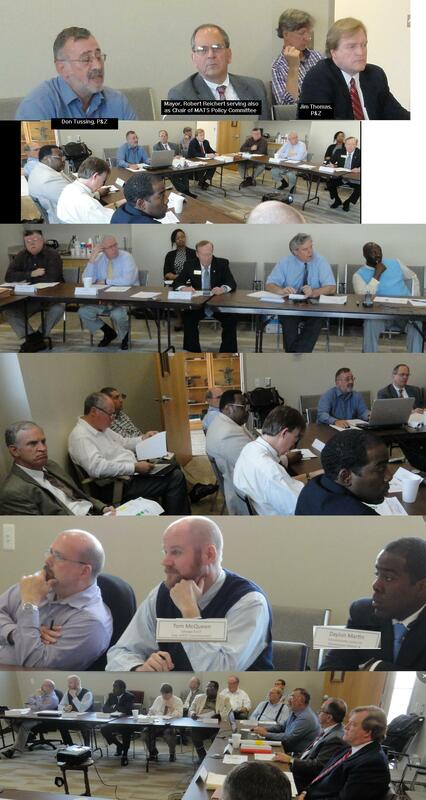 In addition, the CMAQ projects were presented to the committee members for inclusion in the TIP. These projects involve the retrofit of existing vehicles and the purchase of hybrid vehicles. Mr. Ryle also stated that a new set of CMAQ applications are currently being prepared for submittal to the Georgia D.O.T. A resolution to amend the LRTP and TIP was presented by Mr. Ryle to include the year of expenditures estimates and the CMAQ projects. Subsequently, a motion was made by Susan Hanberry Martin and seconded by Tony Rojas to approve the resolution amending the LRTP and the TIP which was approved by the committee. Susan Hanberry Martin also added that the CAC was not able to recommend approval of the resolution. Vernon Ryle also discussed the Conformity Determination Report (CDR). This document is done in order to comply with the air quality requirements for PM 2.5 and ozone levels. As part of the CDR, a regional emission analysis is required using specified modeling techniques. The conformity determination for the amended LRTP and TIP met the required federal emission standards. A resolution to amend the CDR was introduced to the Policy Committee by Vernon Ryle. Subsequently, a motion was made by Mayor Reichert and Tony Rojas to adopt the CDR resolution which was subsequently approved by the committee. The next item discussed on the agenda was the Project Status Report. Tom Queen of Georgia D.O.T. stated that the HPP projects had been added to the report and a meeting concerning the I-75/I-16 interchange project had been held. He also stated that a concept had not been developed yet for the reconfiguration of the Lower Thomaston Rd. and Lamar Rd. intersection. It was determined by GDOT that a roundabout for this project was not feasible and Vernon Ryle asked if this matter could be explained in more detail. Tom Queen stated that in the future the Planning & Zoning Office will be invited to road concept meetings and be provided with right of way plans. Tony Rojas requested that the project status report include all projects and not just preconstruction items. In addition, Lonnie Miley inquired about the Millerfield Rd. project and stated there were sections where the sidewalks were not complete. Charles Bishop commented that David Lucas had already discussed this matter with GDOT. Furthermore, Van Etheridge stated that this project could be completed once the environmental document had been approved. Under New Business, Vernon Ryle stated that at future MATS meetings, the comments of the CAC should be included on the agenda. Susan Hanberry Martin presented a memo from the CAC containing a number of items that were discussed at their last meeting. One of the items requested that all documents to be voted on by the MATS Committees be presented two weeks before the scheduled meeting. Subsequently, Charles Bishop stated that the Policy Committee would not able to vote on the items at this time. Furthermore, Tony Rojas suggested that this item should be placed on the agenda for the next meeting so it can be reviewed in more detail. Charles Bishop stated that the CAC memo would be taken under consideration at the next Policy meeting and there will also be a review of the MATS By-laws and CAC appointments. 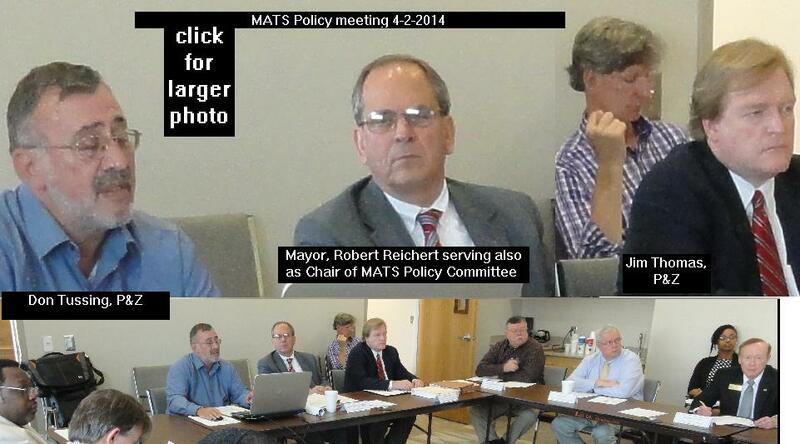 Finally, the new MATS Policy members in attendance were introduced to the committee. Being no further business to discuss, the meeting was adjourned. A meeting of the MATS Technical Coordinating Committee was held on December 12th at 10 a.m. in the Planning & Zoning Office. There were 10 voting members present, thereby establishing a quorum. The minutes of the previous meeting were introduced and approved. The first item discussed was the draft Unified Planning Work Program (UPWP) presented by Jim Thomas. Mr. Thomas stated that this document is required in order to receive federal grants. He reviewed the work program for FY 2009 that included such tasks as MATS Coordination and Citizen Outreach programs. The final copy of the UPWP will be presented in May. Subsequently, a motion was made by Phil Clark and seconded by James Webb to recommend the draft UPWP to the Policy Committee for approval. The motion was approved unanimously by the committee. The next item was the Long Range Transportation Plan (LRTP) and TIP amendments presented by Vernon Ryle. According to the SAFETEA-LU requirements, projections by network year for road projects are required based on year of expenditure amounts. Therefore, the revenue and cost items for projects must use an inflation rate to reflect the year of expenditure dollars. This information was presented to the committee in an amendment to the LRTP. In addition, the CMAQ projects were also presented to the committee members for inclusion in the TIP. These projects involve the retrofit of existing vehicles and the purchase of hybrid vehicles. In addition, Mr. Ryle stated that a new set of CMAQ applications are currently being prepared for submittal to the Georgia D.O.T. Subsequently, a motion was made by Phil Clark and seconded by Kelly Gwin to approve the amendments to the LRTP and the TIP which was approved by the committee. Vernon Ryle also discussed the Conformity Determination Report (CDR). This report is done in order to comply with the air quality requirements for PM 2.5 and ozone levels. The revisions to the CDR involved the different network years for the various road projects. A motion was made by Vernon Ryle and seconded by Ken Sheets to adopt the CDR which was subsequently approved by the committee unanimously. The next item discussed on the agenda was the Project Status Report. Tom Queen of Georgia D.O.T. stated that the HPP projects had been added to the report and a meeting concerning the I-75/I-16 interchange project had been held. He also stated that a meeting concerning the Sardis Church extension had been held and that ROW plans had been approved and property acquisition had begun for this project. Van Etheridge also stated a meeting with the GDOT Urban Design section had been held concerning the project and the problems of the residents in the area were presented. As a result of the meeting, the issues of the citizens were resolved and no houses will be taken as part of the project. Under New Business, Vernon Ryle stated that at future MATS Technical meetings, the comments of the CAC should be presented. He also stated that a committee should be formed to review the existing road projects and work with Georgia D.O.T. This committee should be composed of Jim Thomas, Tim Pitrowski, Phil Clark, and Ken Sheets. James Webb presented a memo from the CAC containing a number of motions that were made at their last meeting. One motion requested that all documents to be voted on by the MATS Committees be presented two weeks before the scheduled meeting. Subsequently, a motion was made by Phil Clark and seconded by Danny Tavakol to forward this recommendation to the Policy Committee which was approved by the TCC members. Another motion that was presented by Mr. Webb stated that the MPO and MATS Committees be provided in the future with updated plans for road projects. Tom Queen of Georgia D.O.T. stated that approved ROW plans for road projects could be made available at the MPO level. Other motions discussed included RIP projects as part of the MATS process and the mediation of the Forest Hill Rd. project. After the memo was presented, it was decided that this information should be presented to the Policy Committee for further review. Also under New Business, Phil Clark stated that the Safe Routes to School plan was scheduled to be finished in March. Being no further business to discuss, the meeting was adjourned. AASHTO - American Association of State Highway and Transportation Officials is the voice for transportation and catalyst for organizational and technical excellence.